In the context of wave propagation analysis the computational efficiency of numerical and semi-analytical methods is essential, as very fine spatial and temporal resolutions are required in order to describe all phenomena of interest, including scattering, reflection, mode conversion, and many more. These strict demands originate from the fact that high-frequency ultrasonic guided waves are investigated. 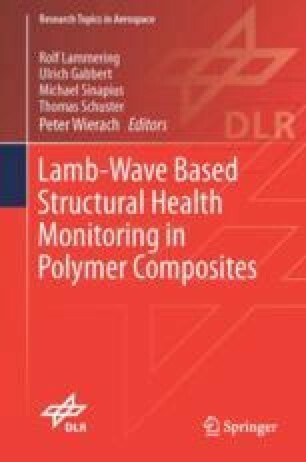 In this chapter, our focus is on developing semi-analytical methods based on higher order basis functions and demonstrating their range of applicability. Thereby, we discuss the semi-analytical finite element method (SAFE) and a hybrid approach coupling spectral elements with analytical solutions in the frequency domain. The results illustrate that higher order methods are essential in order to decrease the numerical costs. Moreover, it is demonstrated that the proposed approaches are the methods of choice when we want to compute dispersion diagrams or if large parts of the structure are undisturbed and, therefore, can be described by analytical solutions. If, however, complex geometries are considered or the whole structure has to be investigated, only purely FE-based approaches seem to be a viable option.